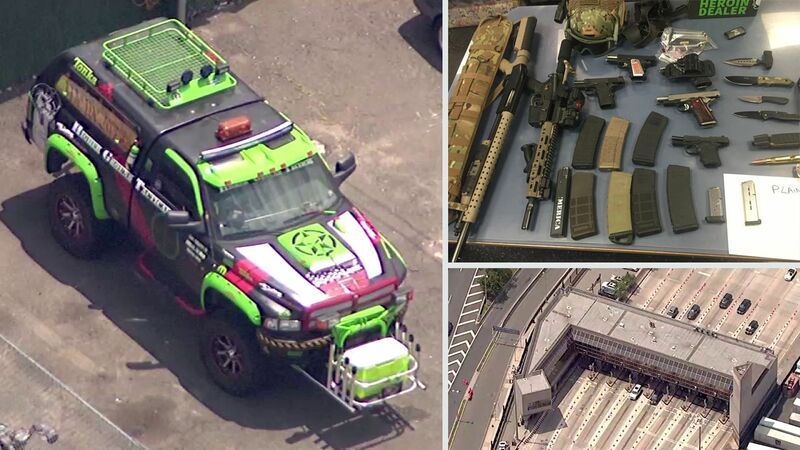 JERSEY CITY, New Jersey (WABC) -- Three people accused of driving from Pennsylvania with a truck full of weapons pleaded not guilty at their arraignment in New Jersey Monday. Authorities say 50-year-old John Cramsey, 53-year-old Dean Smith and 29-year-old Kimberly Arendt were detained as they prepared to enter the Holland Tunnel. Police say their truck, which had gun rights decals on it and a cracked windshield, was filled with weapons. Arendt said she didn't even know there were guns in the car. The three suspects formally pleaded not guilty Monday to the weapons charges contained in the 63-count indictment. All three remain free on bail. Lawyers for all three defendants argued Monday that the search that uncovered the weapons was illegal and said they will file motions to suppress the evidence.